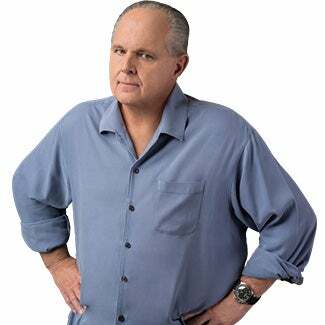 RUSH: By the way, folks, there was another huge fake news story over the weekend that was supposed to obstruct everybody’s attention on the good news. There were two of them. The first story, and it dominated everything, Trump’s gonna fire Mueller by Friday. Democrat congresswoman Jackie Speier said she’s heard Trump’s gonna fire Mueller by Christmas, and that became the news! Saturday, Sunday on the Sunday shows, into this morning, it became the news. It became all anybody was talking about on the verge of tax reform adding to the already growing, burgeoning economy that we are experiencing now. And there is loads of other good news. Optimistic things are happening all over, and they are gonna be damned if they report any of it to you. There was a second story that had everybody captivated, and it was a story that the Trump administration had ordered the Centers for Disease Control to stop using seven words in next year’s budget documents. Now, when I first saw this story, I said, “This is caca. This has to be totally made up caca.” And then when I was reading my tech blogs later the day and saw the outrage there over this, ’cause these tech bloggers all think that they are Einstein scientists. And, by the way, more on that. I can’t wait to get to this. But I get ahead of myself. When I read the outrage, the obscenity filled outrage over this, I said this has to be caca. This cannot possibly be true because this doesn’t make any sense. There was a story that Trump administration had banned the CDC from using these seven words or phrases in next year’s budget documents: fetus, transgender, vulnerable, entitlement, diversity, evidence-based, and science-based. This story first appeared on Friday in the Washington Post. And as I say, I saw it reacted to with obscenity laden posts on my tech blogs, which I immediately realized dumb, stupid liberals believed this because they think Trump is this stupid. But a careful examination, why would the CDC be commanded to stop using the word fetus in budget documents, and transgender, vulnerable, entitlement, diversity? All of these things are sacred to the left, except fetus. That’s the one word in this list of seven that doesn’t belong there if it’s a list designed to tick off — well, by not using the word “fetus” the left should be happy. There’s no such thing as a fetus in their lexicon. A fetus is an unviable tissue mass or is an illness. Well, anyway, the director of the CDC, Brenda Fitzgerald, addressed the report and said this isn’t true. 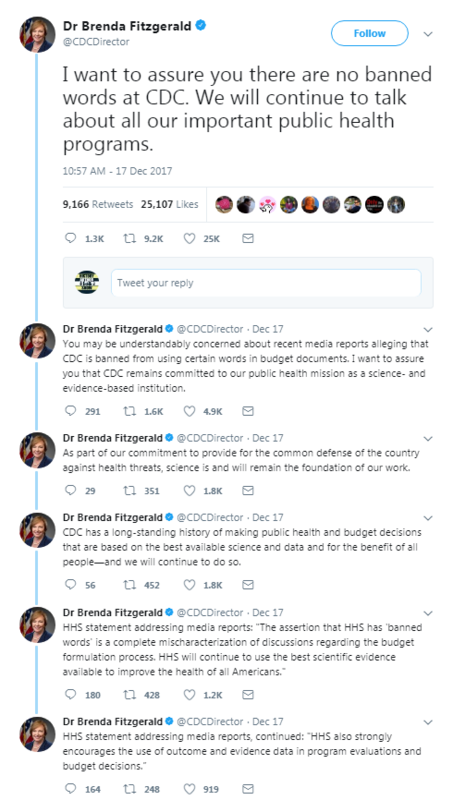 She said in a series of tweets on Sunday that there are no banned words and emphasized that the CDC is committed to data-driven science. This story wanted you to believe that Trump ordered evidence-based and science-based as words not to be used in budget documents and diversity and vulnerable and transgender and entitlement. I’m telling you the truth. I knew this was bogus. I knew it was either made up or purposely misreported exactly when I saw the tech blogs. They lapped it up like it was the same thing as one plus one equals two. They lapped it up, they believed it, they got obscenely angry. But it doesn’t pass any kind of a test. It makes no sense whatsoever. Its starting point is much the same as your starting point on Trump and collusion with Russia. You’re so immersed in it that you believe it. Okay, you get so immersed that Trump hates science because of his opposition to climate change and Trump hates diversity ’cause he’s a racist and Trump hates transgenders ’cause he’s a homophobe and Trump hates entitlements ’cause he’s conservative and Trump hates diversity ’cause he’s a racist and Trump despises evidence-based because he likes to put people in jail without any. If you believe all of that nonsense then you would believe a story like this. These two stories dominated the weekend, folks. This and Trump firing Mueller. Well, all the other, much of it really great economic news, has been totally abandoned, totally ignored. And another one of my tech blogs. I don’t know how many of you people are aware of this, but an asteroid flew right by earth not long ago, closer than it was predicted to fly. Did you read about this? (interruption) It wasn’t what? (interruption) Detected by who? Well, no, it was detected. “A couple of months back, a really, really weird asteroid flew through our Solar System. It looked nothing like any –” I’m reading from a tech blog here, by the way. Just listen to this. I gotta tell you these people all believe that, because they’re in tech, these are tech journalists, that they are scientists extraordinaire, that they’re brilliant, that they are advanced. Yeah, because it’s a rock. An alien probe was what they seriously considered that rock to be. And then the rest of the post is devoted to, what if it was? Stephen Hawking has warned contacting aliens could result in the utter destruction of mankind. Why? Hang on. “We simply don’t know whether intelligent beings living elsewhere in the universe will see us as a friendly neighbor, a threat, or simply a nuisance that should be wiped out simply because we’re annoying them. This is not intended as a joke post. It’s not satire. It’s not parody. This is real. There is now a fear the aliens out there probing us are simply gonna wipe us out ’cause we annoy ’em. And note, by the way, folks, in all of this discussion, aliens are always thousands of times smarter than we are. They have to be. How else would they get here? They would find us to be racist and sexist. They would chastise us for destroying our planet. They wouldn’t want anything to do with us because we are so backwards and stupid, and they might just decide to kill us all. But Hawking has the solution. Colonize Mars. Get outta here. Get off this planet before the real alien probe gets here and wipes us out. Why go to Mars? Why go to Mars? There’s nothing on Mars. There’s no material to build spaceships on Mars. The only place worth visiting if you’re an alien is earth. Why? To meet Stephen Hawking. And then Elon Musk. And resuscitate Jobs. And then Algore for inventing the internet. RUSH: There’s another story over the weekend that died. Remember the story that Lisa Bloom was offering mortgage payments and cash to women to come forward to go public about Trump abusing them? What happened to that story? Where’d that story go? That story got erased by the stupid CDC story, and it was erased by the Trump’s gonna fire Mueller story. BGR: ‘Alien probe’ asteroid is dead quiet, but is that good news or bad news?